Find out how to improve social skills. Understanding the link between autism and communication challenges can help a parent figure out how to help a child with autism. While a number of communication difficulties are common in pervasive developmental disorders, the right treatment plan can make a positive difference. Autism is a neurological condition that begins in early childhood and primarily affects both verbal and nonverbal communication as well as the development of social skills. The American Psychiatric Association's diagnostic criteria, the Diagnostic and Statistical Manual of Mental Health Disorders, Fourth Edition, Revised text (DSM IV-TR), groups autism with four other similar conditions called pervasive developmental disorders (PDD). The other four PDDs are Asperger's Syndrome, Child Disintegrative Disorder, Rett's Syndrome and Pervasive Developmental Disorder Not-Otherwise-Specified. These PDDs are also referred to as a part of the autism spectrum of disorders and all involve communication difficulties. Social Skills Problems: The child may have difficulty interacting with others. He may prefer solitude and show no interest in making friends. Or he may want to make friends but does not know how to approach others and hold appropriate conversation. Verbal and Language Challenges: He displays a poor response to verbal instruction or misunderstands verbal speech. Speech Limitations: The child has limited to no verbal speech or unusual speech patterns. If he has speech, he has trouble sustaining a two-way conversation. He may seem to talk at people during a conversation. Echolalia: He might have patterns of repeating a word or phrases out of context. For example, he may hear a phrase on TV and then hours later repeat it. Mindblindness: He may have problems understanding the emotions of others and respond inappropriately. The difficulties understanding emotional responses can lead to misunderstandings in communication and social situations. Sensory Issues: There may be certain sounds, tastes or sights that bother him or provoke an unusual response. His response may not make sense to others and he does not know how to communicate the reasons for the response. 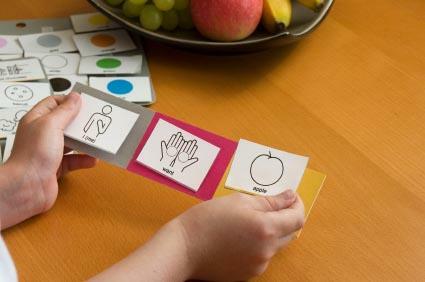 Speech Therapy: Speech therapy can help improve speech, the use of language and broaden a vocabulary. The therapy may involve teaching gestural communication, working with electronic talking devices or using visual communication aids when a child is largely nonverbal. For a child who speaks, the therapy often deals with using language and engaging in two-way conversation. Social Stories: Social Stories, developed by the Gray Center, use stories about social situations to help a child with autism better understand how to interact socially, recognize the emotions of others and how to respond appropriately. Sensory Integration Therapy: Sensory Integration Therapy can treat sensory issues and use the senses to improve a child's reaction to certain stimuli and help the child to communicate his feelings better. Picture Exchange Communication System (PECS): PECS uses a system of picture cards as a means of communication. The PECS approach can teach a nonverbal child to understand and use language in order to communicate and learn effectively. Parents can improve autism and communication difficulties by learning as much as possible about autism and the latest treatment options. They should pay close attention to how their child responds to different therapies and situations to figure out how the child best communicates and learns. The parents need to work closely with therapists, doctors and teachers. All of these things can help parents advocate for their child to find the best solution for his specific needs. A child's rate of improvement depends upon the level of impairment, which can vary greatly in autism. Yet, once parents find the right treatment plan for their child, significant improvements in communication skills are possible.